2 High Rigger has been added to your favorites! 2 High Rigger has been removed from your favorites! 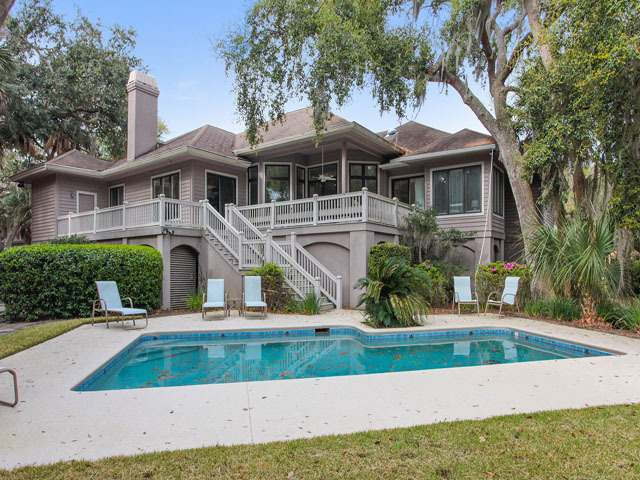 Come see this Hilton Head Island beach home featuring a NEW, COMPLETELY RENOVATED outdoor living space that includes a new pool and spa, covered porch, pool deck, kitchen/bar area and plenty of seating! 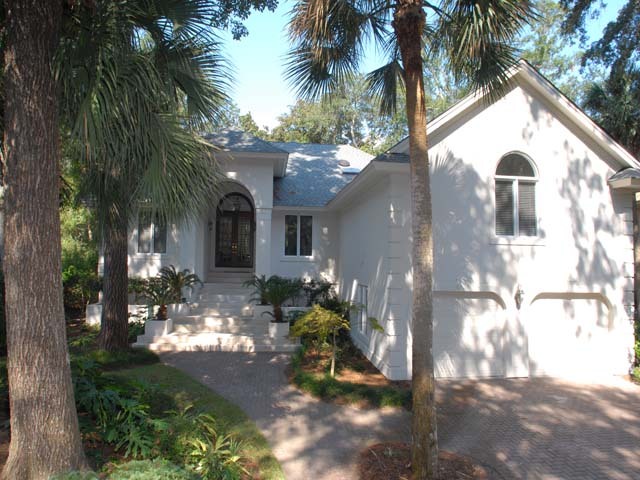 This masterpiece beach home located on a corner lot in Palmetto Dunes Plantation is perfect for large groups as it features seven bedrooms with private in-suite bathrooms, two additional bathrooms, two spacious living rooms, and a newly renovated backyard oasis. This private plantation offers quiet, low traffic streets and multi-million dollar homes. 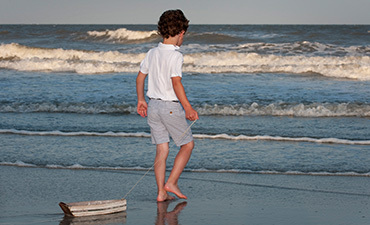 A quick two-minute walk along the newly rebuilt beach path takes you to the sand of one of the most exclusive beaches on Hilton Head Island. Upon entering the home, you are welcomed with a beautifully decorated, expansive great room that features a 50” wall-mounted plasma HDTV with Bose surround sound and Blu-ray DVD player and a full view of the pool deck space. The fully equipped kitchen is adorned with all stainless steel appliances including two full-sized Kitchenaid dishwashers and granite countertops. The center island has three barstools while the breakfast table provides four additional seats. A half bath and a laundry room with a second full size refrigerator are adjacent to the kitchen area. The spacious dining room is connected to the kitchen by a butler’s pantry and offers seating for 12 comfortably. This space is perfect for gathering large groups to share a meal at the end of the day. The main floor of the home offers three bedrooms. The master suite off the kitchen features a king four-poster bed, flat-screen 39” Vizio HDTV and walk-in closet. This suite also offers a private bathroom adorned with travertine countertops, a spacious jetted Jacuzzi and a separate tiled shower with two showerheads. The second bedroom at the front of the house features a king bed, flat-screen 42” plasma HDTV and a private bathroom. The third bedroom offers a queen bed, flat screen 39” Vizio HDTV, a private bathroom and views of the back deck and crystal blue pool. The staircase will lead you to the second floor of the house, which features a large second living room and four more bedrooms. The second upstairs living room consists of a sofa, chairs and a queen sleeper sofa bed, as well as an additional full bathroom. A 55” flat screen Vizio HDTV, Bose surround sound, and Blu-ray DVD player make this room the perfect place to enjoy a family movie night. This upstairs living room has it’s own doors so one can easily close the doors and use this as a private eighth bedroom. The first two upstairs bedrooms offer a queen bed, private bathroom and 39” flat screen Vizio HDTV in each. The third bedroom offers two twin beds, a private bathroom, and a flat screen television with a built in DVD player. The fourth bedroom upstairs has a king bed, private bathroom and a 39” flat screen Vizio HDTV. The sliding glass doors off the main floor great room lead you to the NEW, COMPLETELY RENOVATED porch, pool deck, outdoor bar and NEW heat enabled pool and spa. The expansive covered porch offers an elevated entertainment area with lounge wicker furniture and a six-person patio table. Three ceiling fans help you to escape the South Carolina heat. The new outside deck area offers a large space for sun bathing and entertaining by the pool. With a total of 12 new chaise lounge chairs, a table with 8 surrounding chairs, 6 Adirondack chairs, and a bistro table with two chairs, you can pick your best position to unwind. Attached to the deck is the BRAND NEW outdoor bar, which features granite counter tops, a third full-sized refrigerator, a 60” flat screen Vizio HDTV, 8 bar stools, and a stainless Kitchenaid gas grille making this location the ideal spot for an outside summer barbeque. The NEW large 32’ x 16’ pool is perfect for lounging in the sun or playing a variety of pool games. 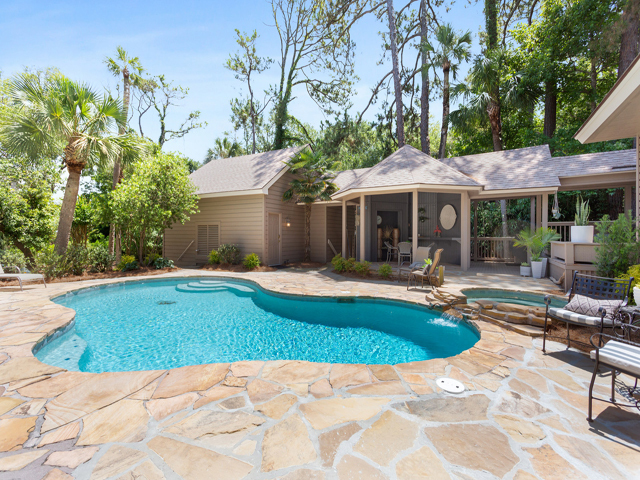 The pool and the separate jetted spa can be heated at your convenience for an extra charge. You will find that this home is conveniently located and is maintained at the highest standards for the comfort and enjoyment of our guests. Free Long Distance calling to anywhere in the US, Wifi internet and Cable television are offered at no additional charge.